Tomatoes are poisonous. That’s what people once thought. Now we know they are good for all kinds of things from fighting cancer to reducing the duration of the common cold. A little knowledge goes a long way. This photo is a shot of the riot that is Phil’s garden this summer. For a number of years, he’s been trying to grow vegetables on the south side of our property, the most logical place, you’d think, in terms of consistent sun, to plant things, but to no avail. Everyone else in our desert-ish region seems to have no trouble. You can drive up and down any street in August and September and see hand-drawn signs bragging about produce for sale (or in the case of zucchini, they offer to pay you to take it away). Not us. Most years, we’ve been lucky to get enough tomatoes for a sandwich on that side of the house. Forget onions, potatoes, peppers, cucumbers, squash, cantaloupe, peas, beans, watermelon. Pretty much everything we’ve tried to grow in that spot either produced minimally or completely failed. I don’t remember now by what miracle we discovered this, or whether it was Phil or I who did, but at some point this last year we learned that almost nothing will grow in the vicinity of a black walnut tree. It turns out black walnut contains a harmless substance known as hydrojuglone—harmless until it comes in contact with, oh, air or rain, in which case it spreads and is just about as toxic as wildfire. That harmless chemical becomes juglone which is murderous to most anything you plant in the ground and hope eventually to put in a canning jar. Well, of course, the south side of our property is ruled by a rather large black walnut. We like that tree because the local squirrels love the nuts so much, and we enjoy the myriad way they store those nuts. They often will dig up a flower bulb to make room for the nut and then kindly replant the bulb someplace else, so that in spring, we never know what is going to grow where and we often are gifted with flowers from the neighbors. This is in keeping with the randomness of our flower garden, of which the entire front of our property is comprised. Just like they love our chestnuts, mulberries, grapes, and, at Christmas time, the intoxicating holly berries, and we love watching them falling around intoxicated. Every year there is quite the squirrel party at our house, complete with skirt-chasing, squealing, and hire-wire acts. We also love our walnut tree because our neighbor hates it so much. Well, he hates our entire urban forest, and that walnut tree is part of what keeps us from being reminded that he is over there, hating our forest. It’s part of what screens out his ugly parking lot, his bocce ball court, and his tenants with their many visitors. Safe to say juglone has no effect on humans. Or maybe we have all been poisoned by juglone, and our mutual dislike is the symptom. Regardless, this year, we took out a few trees, thinned some others, and Phil planted as many vegetables and herbs as he dared in the northeast corner of our property where the land gets plenty of light for most of the day but is protected from the searing late afternoon sun. Since he retired this spring, he has been able to spend his mornings outside attending to them. The result is unprecedented (for us) bounty. Grapefruit-sized tomatoes clustered like grapes. What we know now that we did not know is how happy especially tomatoes are when you talk to them a little bit. A system of soaker hoses on a timer helps, too. I love it that he goes out there first thing, before he even gets to his tea and toast, to communicate with these space invaders. Also that he’s bought himself a preserving book and quart canning jars. Already he’s harvested perhaps 120 pounds of tomatoes. No idea how many quarts of sauce are now in the freezer. I’m guessing we have at least another 200 pounds of green tomatoes still on the vine, and blossoms thick as clover. I suppose bounty is on everyone’s mind at this time of year. Certainly our local farmers’ market is proof that we are not the only ones being visited by the vegetable fairies. I feel a bit guilty that I have not yet put away more, but I know there is still time, and still more good fruit and vegetables to come. With Phil out of town to visit an old school pal in Alaska, I’m in charge of his charges, yet I find myself preferring solitary sitting and staring. A form of meditation, really, with a tomato backdrop. We had a busy summer, with a tough trip to my parents’ house in the Midwest and trying to adjust to his retirement and me working a new job from home. It’s the dog days of August, and I fit right in. Bounty that none of us is grateful for are the wildfires all around us in the western U.S. So many souls out there on the battle lines fighting to minimize the fires’ impact while I sit on my deck surveying our man-height tomato plants with a glass of imported sparkling mineral water over ice. All I have to do is walk into my house to get away from the smoke, to feel cool and refreshed. Such decadence. I’m reminded of my first years of living in the West, not knowing if we’d be burned out in the night or if the blessed rains would come in time to save us before we did. These things I’ve only experienced from the safety of town, yet I send up prayers to the great rain gods as if I’m the one on fire. I know how fast flame moves. I’ve been present when a forest fire could have taken off. I’ve hiked in ghost forests. I know how easily we could be facing ruin. Then the thought comes: what am I afraid of? All I have to do is divert a water hose to a sprinkler, keep my little corner of the earth dampened and protected. We’ve got an entire river out there—two of them, in fact—and one of them is one of the biggest in the United States. Today, I made bread from no more ingredients than buckwheat groats, salt, and water. A fermented bread. All the water I needed—a number of quarts—came right from my tap and through a filter. Such privilege. Still, that loaf of bread will stay me for a week, costs pennies compared to the $7 or $8 I’d have to pay for a gluten-free loaf from a bakery, and those quarts, along with the gallons I share on our gardens would have little impact on the hundreds of thousands of acres of fires that burn around us. Nobody thinks about those kinds of things. Why should I? Hourly I visit the federal fire incident website. The inn where I hold writing retreats is near a major burn. I heard from my friend Ruth a day or so ago. They are doing what I’m doing: protecting their green space and their buildings, sprinklers going day and night, she said. Those 2 big rivers—like all the rivers in our region—are low. Little snow last winter. Little rain this spring. Hot, hot, record-setting days of heat since then. What is good for our tomatoes and Phil’s little garden is not good for anybody else. Daily this past week I have been the one working in the smoky morning air to tend and whisper to them, to pluck them, ripe and red as fire, the drone of belly-dump planes and helicopters interrupting the peaceful mornings. The news this morning reported more than 140 homes and buildings burned in our area. How many walnut trees? 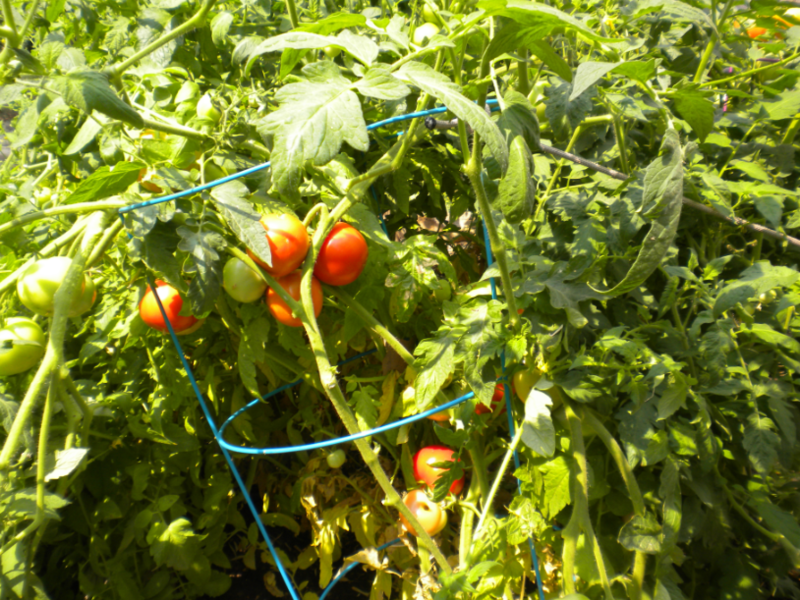 How many tomato vines? I fueled my paranoia yesterday by reading about the West’s 1910 firestorm when hurricane-force winds caused several thousand small fires to merge into a single deadly inferno in which dozens of people died. Trees hundreds of years old exploded like Roman candles, lifted root and all from the ground by the energy of the explosion. Right now in the West there are hundreds of fires, merged on the incident website as “complexes.” A complex may contain dozens of individual fires. In the last two days, a “cold front” (meaning the temperature dropped from the triple digits to the 90s) and high winds caused regional fires to multiply in number, size, and intensity oddly left our air in the Lewis-Clark Valley briefly more clear and yesterday blue was visible in places. Today you can almost see the hills that surround our valley, yet the fires are larger than ever. The winds that exacerbated the fires briefly swept our air clean. In my mind the fires are rushing toward my sons and their families, who are camping this weekend, one set in the Umatilla National Forest in Northeast Oregon and the other hundreds of miles away in the Payette National Forest in central Idaho. I worry that they will somehow become trapped by the fires or injured by smoke in their sleep. There’ve been more grizzly sightings, more wolves. My mother energy is spread far and wide today. According to the paper this morning, a seventy-year-old woman from a nearby community fell as she was trying to evacuate her home. She subsequently died from the head injury. What had she gathered to take with her? Were her last thoughts about what possessions were most precious to her? Did she take one last peek at her vegetable patch before fleeing? Grab a few green tomatoes? I lift my water glass in a toast to her and to all those on the frontlines, a wordless beseeching to whomever out there is in charge of appropriating rain.